*For EMERGENCIES for current patients, contact the doctor directly by clicking here. 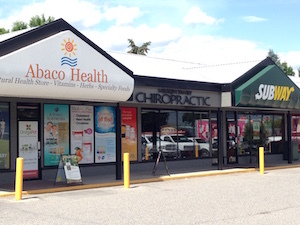 We’re located directly in between Abaco Health and Subway in the Mission Station plaza. Our office is located at the intersection of Gordon Drive and Cook Road, just north of Mission Creek. We’re half a block from the Mission Creek Greenway at Gordon Drive, and the H20 Aquatic + Fitness Centre is just south of our office; mission sports fields and Capital News Centre are only minutes away. You’ll see us in a shopping plaza with a Husky gas station. Plenty of parking is available right in front of our office. If you’re taking public transportation, bus route 5 has a stop directly in front of us.